This gorgeous, solid wood serving / cutting board has been hand crafted from locally salvaged Black Walnut from Central Massachusetts. This board has a large live edge along the top surface, giving the grain an amazing depth of color and character with it's honed barked live edge on the long edge, and a sculpted edge on the parallel edge. The opposite side of the board features a dark chocolate brown heartwood grain, with a few birdseye figures creating unique grain curves. This thick solid black walnut board is perfect for use as a unique sushi serving board, rustic serving tray or cheese board; perfect for a one of a kind wedding or anniversary gift. This solid cherry wood serving and cutting board has a beautiful grain with an overall warm honey brown color interrupted by color variations from dark tans,pinks to honey yellows. A natural live edge along the sapwood showcases the area underneath the tree bark---with depth of figure, color and character. The variation in heartwood and sapwood natural coloring make this board quite unique. 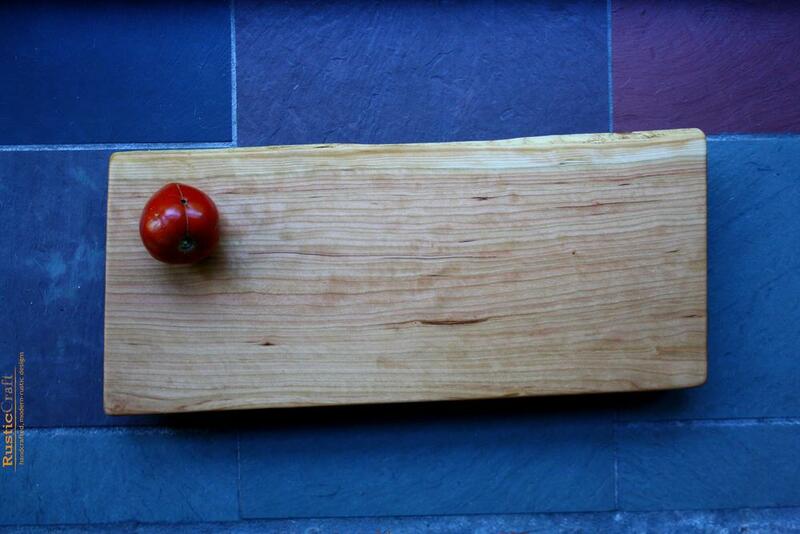 This hand crafted board from locally salvaged black cherry from Central Massachusetts would make an amazing gift for any cook; adding a rustic charm to any modern kitchen. This medium-large rustic, solid wood serving / cutting board has been hand crafted from locally salvaged black cherry from Central Massachusetts. It has many unique grain figures with an overall warm honey brown color. It has a natural arc shape flaring out the center with a gorgeous swirling grain detail with iridescent figures within. Birdseye figures appear on the surface adjacent to some barked knot details at the edge. This board lends an essence of rustic charm to any modern kitchen. Two cherry feet run the width of the board to elevate it from the work surface. A live edge runs the length of the board showcasing the natural edge underneath the bark with tunneling details. This footed black cherry would make an amazing rustic cheese serving platter or sushi serving tray...any appetizer or natural food with a rustic feel! Perfect for a small dinner get together. With a distinctive large white grain, rich yellow-honey color, and hard-dense-heavy wood characteristics, the great feature of Black Locust is it is an extremely heavy and dense wood, extremely resistant to denting and wear, making it an excellent cutting board material! The grain pattern is best seen at the end grain of the board--simply stunning rings of growth can be seen here. The long edge of the board features a natural live edge with tans & browns, showcasing the natural history of the tree underneath the bark. Two dark reclaimed mahogany feet run the width of the board to elevate it nicely from the work surface. 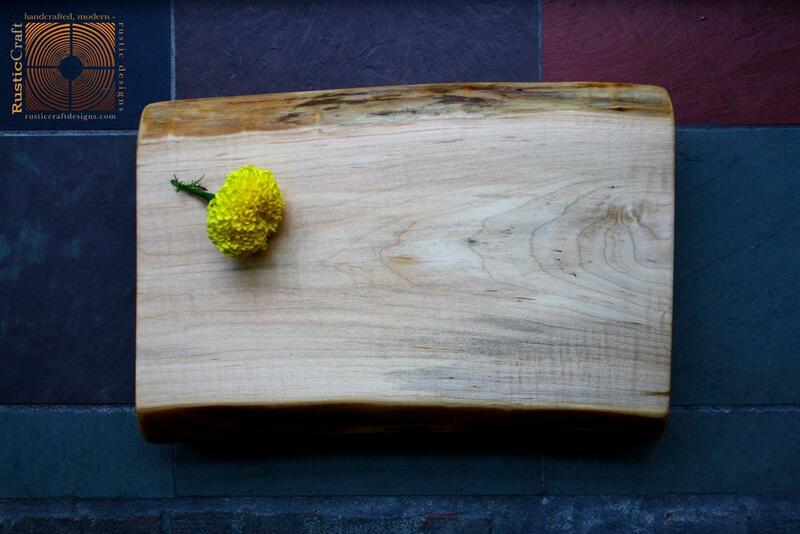 This hand crafted board from locally salvaged black locust from Central Massachusetts would make an amazing gift for any cook; adding a rustic charm to any modern kitchen. This gorgeous, solid wood serving / cutting board has been hand crafted from locally salvaged black walnut from Central Massachusetts. This board features a finished squared edge on the side ends with a sculpted natural live edge on the long upper edge, where amazing unique splashes of colors occur in the sapwood thanks to unique spalt figures that outline the lighter tans and yellows with black outlines. Both sides of this incredible black walnut can be utilized---we recommend using one side for cutting, and flipping it over for dinner parties or gatherings for use as an natural art, focal serving piece; gives a modern kitchen an essence of rustic charm. This solid black walnut board is perfect for use as a unique sushi serving board, a great size for garlic and herb chopping, a unique rustic serving tray or cheese board; perfect for a wedding or anniversary gift with added personalization. This medium-large, long sized, rustic, solid wood serving / cutting board has been hand crafted from locally salvaged Black Cherry from Central Massachusetts. It has gorgeous figure from the sapwood of the cherry tree to the heartwood with a beautiful grain and warm honey brown color. The live edge is full of dark brown and tan colors; showcasing the natural history underneath the bark of the cherry tree. Two Black Cherry feet run the width of the board to elevate it from the work surface nicely. This footed black cherry would make an amazing cutting board, rustic cheese serving platter, sushi serving tray or great for any appetizer or natural food with a rustic feel! Perfect for a small dinner get together. Gives a modern kitchen an essence of rustic charm. Hand crafted from locally salvaged black cherry from Central Massachusetts, this solid wood serving / cutting block has a beautiful organic shape with a live edge along the sapwood and sculpted edge at the heartwood. This board has a clear grain with an overall honey brown color, sharply delineating the color at the sapwood to a silvery yellow color at the live edge. A live edge runs the length of the board which gives unique depth of color and character; showcasing the natural colors underneath the bark. This organic shaped wood block would be fabulous for complimenting cheeses, grapes, olives...any appetizer or natural food with a rustic feel...perfect for dinner parties or gatherings as an natural art, focal serving piece. This large, rustic, solid wood serving / cutting board has been hand crafted from locally salvaged black cherry from Central Massachusetts. This amazing cherry board has been cut from the heartwood of the cherry tree....with amazing grain and an even more amazing curl figure! Large bands of curl figure run throughout both sides of the board, radiating out from a sculpted grooved knot---and wide bands of barcode like figure---giving an amazing iridescent feel, with beautiful circular bands of grain radiating from the center and an overall warm honey brown color. Included with the board are Black Cherry rails, with anti-skid rubber grips on both sides. This design feature allows the rails to be placed upon the countertop and the board to be placed atop the rails. Since the board is not attached to the rails this allows for both sides of this incredible board to be utilized---we recommend using one side for cutting, and flipping it over for dinner parties or gatherings for use as an natural art, focal serving piece. The elevated surface allows this board to double as a comfortable height cutting board and a unique serving tray; complimenting cheeses, grapes, olives...any appetizer or natural food with a rustic feel! 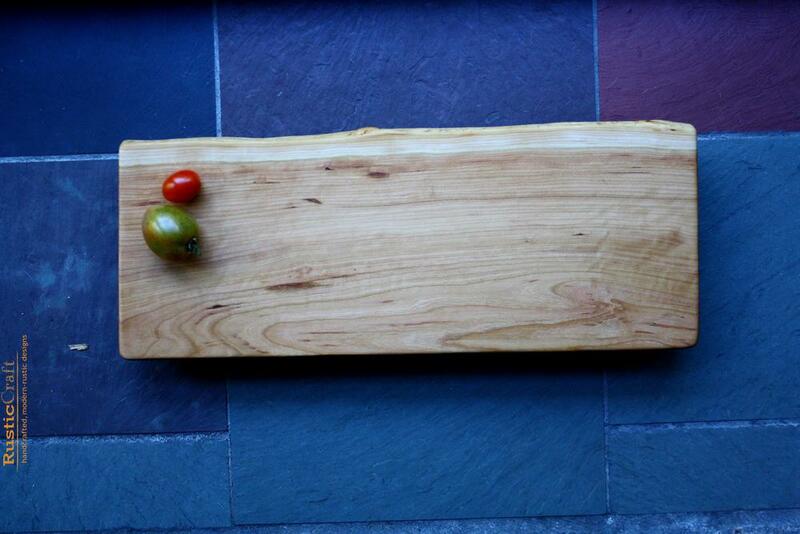 This hand crafted board from locally salvaged black locust from Central Massachusetts would make an amazing gift for any cook; adding a rustic charm to any modern kitchen. The great feature of Black Locust is it is an extremely heavy and dense wood, extremely resistant to denting and wear, making it an excellent cutting board material! With a distinctive large white grain, rich yellow-honey color, and hard-dense-heavy wood characteristics. The grain pattern is best seen at the end grain of the board--simply stunning rings of growth can be seen here. The back long edge of the board features a natural live edge with tans & browns, with a squared edge on the ends and front long edge. Included with the board are Reclaimed Mahogany rails, with anti-skid rubber grips on both sides. This design feature allows the rails to be placed upon the countertop and the board to be placed atop the rails. Since the board is not attached to the rails this allows for both sides of this incredible board to be utilized---we recommend using one side for cutting, and flipping it over for dinner parties or gatherings for use as an natural art, focal serving piece. An amazing natural grain, with an overall reddish tan yellow coloring; this small cutting board has a live edge runs it's length, showcasing the natural coloring underneath the bark. Two Black Walnut feet run the width of the board, elevating it nicely from your word surface while giving beautiful juxtaposition between the neutral colored White Ash and the Chocolate Brown Walnut. The grain pattern is very pronounced, with variable-length grains interrupted by dark brown tangential bands that visibly wrap around the side edges in a very unique pattern. Hand Crafted from locally salvaged White Ash & Black Walnut from central Massachusetts, this footed board is perfect for chopping herbs and garlic, or limes and lemons. This long rustic, solid wood serving / cutting board has been hand crafted from locally salvaged black cherry from Central Massachusetts. It is highly figured, large bands of quilt figure run throughout the board---giving an amazing iridescent feel, with a beautiful grain and warm honey brown color. The grain curves and wraps around a shallow barked knot on one surface.The variations in heartwood and sapwood natural coloring makes this board simply unique. Included with the board are Black Cherry rails, with anti-stick rubber grips on both sides. This design feature allows the rails to be placed upon the countertop and the board to be placed atop the rails. Since the board is not attached to the rails this allows for both sides of this incredible board to be utilized---we recommend using one side for cutting, and flipping it over for dinner parties or gatherings for use as an natural art, focal serving piece. This gorgeous, solid wood serving / cutting board has been hand crafted from locally salvaged Curly Maple from Central Massachusetts. This thick, medium slab has an overall silvery honey color with instances of brown streaks of Ambrosia patterning on both surfaces. Curl figures that have an iridescent quality ---that seem almost 3 dimensional--- pop into your vision on both surfaces of this unique board, wrapping and radiating around a unique knot detail on the rear, and running through the entire top surface, with a particularly beautiful instance of curl figure along the rear live edge of the top surface. Along the Live Edges the bark has been left intact showcasing the natural history underneath the bark of the tree with unique color and grain details. Both sides of this incredible board to be utilized---we recommend using one side for cutting, and flipping it over for dinner parties or gatherings for use as an natural art, focal serving piece. This unique block would make an amazing gift for a natural foodie; adding a rustic charm to any modern kitchen. 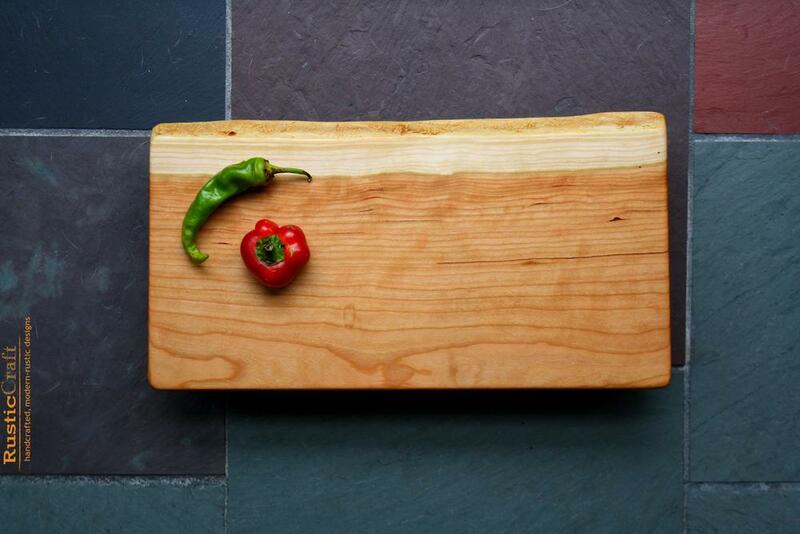 Hand crafted from locally salvaged maple from Central Massachusetts.This unique statement block would make an amazing gift for a natural foodie; the perfect size board to keep atop the counter in any style kitchen, rustic to modern. This rustic, solid wood serving / cutting board has been hand crafted from locally salvaged black cherry from Central Massachusetts. This board is VERY thick and HEAVY, almost 2 inches thick, with a beautifully wide heartwood grain and warm honey brown color. Spalt figure occurs on the live edge expanding onto the top surface of the board, giving amazing depth of color in unique forms. A sculpted groove occurs on the back surface. The variation in heartwood and sapwood natural coloring make this board quite unique. This board lends a piece of country charm to any modern kitchen. Both sides of this incredible board are able to be utilized---we recommend using one side for cutting, and flipping it over for dinner parties or gatherings for use as an natural art, focal serving piece. Dimensions: It measures approx. 15.3in length x 7.3in width. Thickness is approx. : 1.9in. thick. This medium rustic, solid wood serving / cutting board has been hand crafted from locally salvaged black cherry from Central Massachusetts. It has many unique grain figures with a warm honey brown color. It has a natural arc shape flaring out the center with a gorgeous swirling grain detail with iridescent figures within. Birdseye figures appear throughout the surface. This board gives a modern kitchen an essence of rustic charm. It measures approx. 12.7in. length x 7.7in. in width. Here is a Curly Tiger figure maple board with a honey silver coloring throughout interrupted by varying bands of blacks, tans and spots of browns. The curl figure is the iridescent bands you see running perpendicular to the length of the board---these figures give the board a rippled look, but the board surface is actually flat and smooth to the touch! Many bands of curl figure make this a very rare piece. Included with the board are two Black Walnut Rails, with anti-skid rubber grips on both sides. This design feature allows the rails to be placed upon the counter top and the board to be placed atop the rails. Since the board is not attached to the rails this allows for both sides of this incredible board to be utilized---we recommend using one side for cutting, and flipping it over for dinner parties or gatherings for use as an natural art, focal serving piece. Simply an amazing work of nature. A full of color live edge gives amazing depth of color and character to this unique long skinny cheese or sushi board! This unique block would make an amazing gift for your natural foodie; adding a rustic charm to any modern kitchen. Here is a quilted figure maple board with a honey silver coloring throughout interrupted by varying bands of blacks, tans and spots of browns. The quilt figure is the iridescent bands you see running perpendicular to the length of the board---these figures give the board a rippled look, but the board surface is actually flat and smooth to the touch! Simply an amazing work of nature. A spalted live edge gives amazing depth of color and character to this unique long skinny cheese or sushi board! This unique block would make an amazing gift for your natural foodie; adding a rustic charm to any modern kitchen. Hand crafted from locally salvaged black cherry from Central Massachusetts, this long solid wood serving / cutting block has a beautiful organic shape with a live edge along the sapwood and sculpted edge at the heartwood. This board has a clear grain with an overall honey brown color, sharply delineating the color at the sapwood to a silvery yellow color at the live edge. The long edge of the board features a natural live edge with tans & browns, showcasing the natural history of the tree underneath the bark. 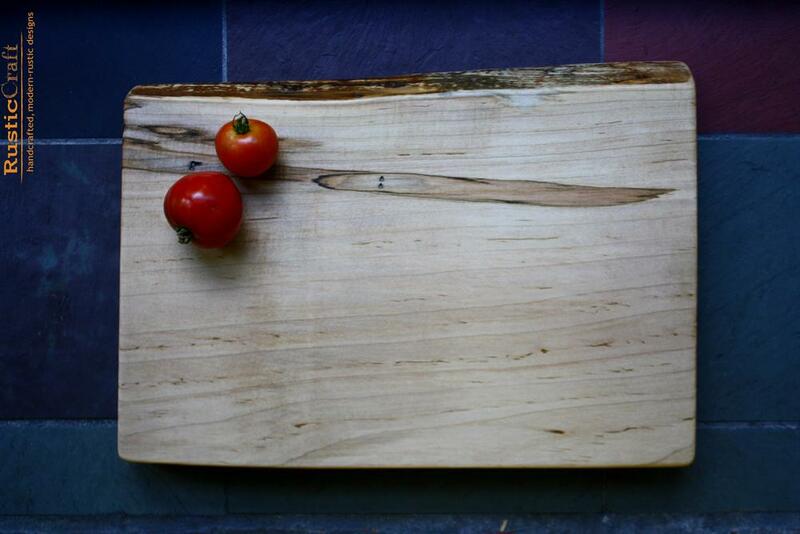 This hand crafted board from locally salvaged black locust from Central Massachusetts would make an amazing gift for any cook; adding a rustic charm to any modern kitchen. 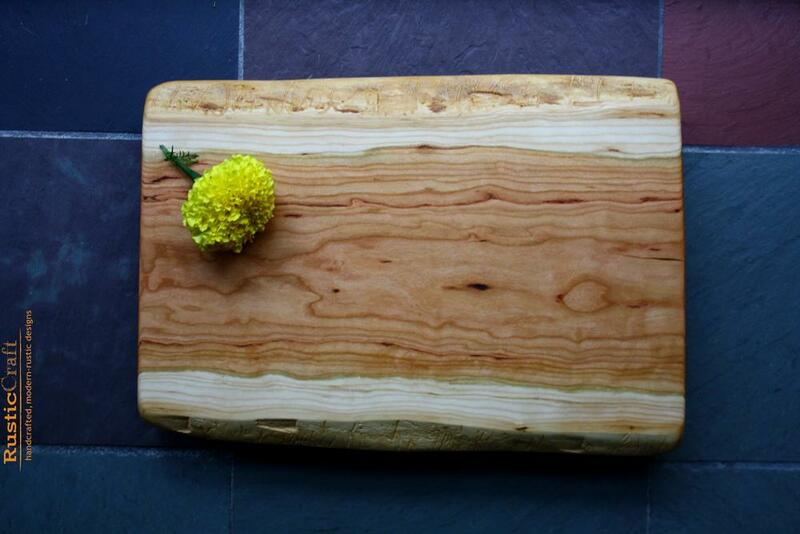 The great feature of Black Locust is it is an extremely heavy and dense wood, extremely resistant to denting and wear, making it an excellent cutting board material! With a distinctive large white grain, rich yellow-honey color, and hard-dense-heavy wood characteristics, the grain pattern is best seen at the end grain of the board--simply stunning rings of growth can be seen here. The front long edge of the board features a natural live edge with tans & browns while the rear live edge showcases a natural organic curve with a colored live edge. Some natural surface checking occurs throughout. Two matching black locust feet run the width of this honey-yellow board elevating the board from the work surface nicely. This medium footed black cherry has been handcrafted from salvaged cherry lumber from Central Massachusetts. With an organic curvy shape at the live edge, the majority of the board surface is a warm, honey brown color; gradating to light tans at the live edge of the board. A natural live edge runs across the length of the board, showcasing the natural history underneath the bark. An instance of birdseye figure occurs along the upper right top surface, where the natural live edge curves out, giving this area a 3d iridescent quality. Two matching black cherry feet fun the width of this gorgeous little board, elevating it from your work surface for ease of use. This unique board would make an amazing rustic serving platter; complimenting cheeses, grapes, olives...any appetizer or natural food with a rustic feel! This rustic, solid wood serving / cutting board has been hand crafted from locally salvaged black cherry from Central Massachusetts. It has a natural, organic shaped curvy live edge; full of color with browns and tans;showcasing the natural history underneath the bark. It is lightly figured, with a beautiful grain and warm honey brown color. Patches of whites and tans appear on the surface in unique character. Two black cherry feet run the width of the board, elevating it from your work surface nicely for ease of use and increased airflow around the board when drying. It measures approx. 15.5in length x 7in width. This solid cherry wood serving and cutting board has an incredibly beautiful grain with an overall warm honey brown color interrupted by incredible color variations from dark tans to bright honey yellows. A Natural live edge along the sapwood showcases the area underneath the tree bark---with depth of color and character. The variation in heartwood and sapwood natural coloring make this board quite unique. Handcrafted from salvaged Ambrosia Maple from Central Massachusetts, here is a long live edge maple board with a honey silver coloring throughout interrupted by varying bands of brown rays, tans and splashes of brown ambrosia detailing. Simply an amazing work of nature. Live edges give the board a unique, organic character; giving depth of color and character to this beautiful piece. Two salvaged Black Walnut feet run the width of the board to elevate it from the work surface. The elevated surface allows this board to double as a comfortable height cutting board and a unique serving tray; complimenting cheeses, grapes, olives...any appetizer or natural food with a rustic feel...perfect for dinner parties or gatherings as an natural art, focal serving piece. It measures approx. 14.6in. length x 6.8in. wide. This board is cut from one of the most AMAZING maple trees we have ever had the pleasure to work with! An intensely gorgeous, solid wood serving / cutting board has been hand crafted from locally salvaged Maple from Central Massachusetts. This is an Ambrosia Tiger Maple---with an incredible amount of tiger curl figure combined with an equally incredible amount of ambrosia detail---AHmazing. The tiger curl gives the surface an iridescent wavy look--looking like ripples n the surface, but the board is smooth as silk to the touch. Ambrosia splashes occur repeatedly throughout the surface--the tan and brown swooshes caused by mineral deposits during the trees formation. The surface with the live edge has a decent amount of wavy ambrosia with intense tiger curl figure---and then the opposite surface has an INCREDIBLE amount of ambrosia details with the same amazing tiger curling...this piece is incredible. This solid Maple board is perfect for use as a unique cutting board & serving board, rustic serving tray or cheese board; perfect for a wedding or anniversary gift. This rustic, solid Black Cherry wood serving / cutting board has gorgeous figure with a beautiful curvy live edge shape, with splashes of colored grain patterns that compliment the overall warm honey brown color. The live edge showcases the natural edge underneath the bark with dark tans and dark browns. Two reclaimed Mahogany feet run the width of the board to elevate it from the work surface. The elevated surface allows this board to double as a comfortable height cutting board and a unique serving tray; complimenting cheeses, grapes, olives...any appetizer or natural food with a rustic feel...perfect for dinner parties or gatherings as an natural art, focal serving piece. This gorgeous, solid wood serving / cutting board has been hand crafted from locally salvaged black walnut from Central Massachusetts. The board has iridescent curl figures giving a 3d effect to areas of the board. This board features a finished squared edge on the side ends with a honed barked natural live edge on the long edge and a sculpted live edge on the parallel long edge. Both sides of this incredible board to be utilized---we recommend using one side for cutting, and flipping it over for dinner parties or gatherings for use as an natural art, focal serving piece; gives a modern kitchen an essence of rustic charm. This gorgeous, solid wood serving / cutting board has been hand crafted from locally salvaged black walnut from Central Massachusetts. This incredibly beautiful black walnut board is VERY black---cut from the heartwood of the tree---the delineations between heartwood and sapwood are slight with a majority of the board a very deep brown/black color. An organically shaped live edge runs the length of the board, showcasing the natural history of the tree underneath the bark. Along one of the live edges the character is amazing on the surfaces with splotches lighter colors of tans and browns---unique variations of color in the grain to this area. Included with the board are two reclaimed Mahogany wood rails, with anti-skid rubber grips on both sides. This design feature allows the rails to be placed upon the counter top and the board to be placed atop the rails. Since the board is not attached to the rails this allows for both sides of this incredible board to be utilized---we recommend using one side for cutting, and flipping it over for dinner parties or gatherings for use as an natural art, focal serving piece. This solid black walnut board is perfect for use as a rustic serving tray or cheese board; making a unique and one of a kind wedding or anniversary gift. This fabulous black walnut board has such a beautiful rich chocolate brown color---cut from the heartwood of the tree---the delineations between heartwood and sapwood are very slight with organic live edges running the length of the board, showcasing the natural history of the tree underneath the bark. Included with the board are two Reclaimed Mahogany rail stands, with anti-skid rubber grips on both sides. This design feature allows the stands to be placed upon the counter top and the board to be placed atop the stands. Since the board is not attached to the rail stands this allows for both sides of this incredible board to be utilized---we recommend using one side for cutting, and flipping it over for dinner parties or gatherings for use as an natural art, focal serving piece. Hand Crafted from locally salvaged White Ash & Black Walnut from central Massachusetts, this footed board is perfect for chopping herbs and garlic, or limes and lemons. Use it as a small, solid cutting board or unique rustic party serving tray; with additional personalization it is perfect for a wedding gift, anniversary gift, or a birthday gift. This beautiful black walnut board has delineations between heartwood and sapwood thatare very slight with a majority of the board a chocolate brown color. A live edge runs the length of the board, showcasing the natural history of the tree underneath the bark. Two dark black walnut feet run the width of the board to elevate it nicely from the work surface. This gorgeous, solid wood serving / cutting board has been hand crafted from locally salvaged black walnut from Central Massachusetts. while on the opposite side the heartwood is deep chocolate brown with curl figures that have an iridescent quality that seems almost 3 dimensional. On the sides the bark has been left intact showcasing the natural history underneath the bark of the tree with unique color and grain details. This thick, medium slab has an overal silvery honey color with instances of brown streaks of Ambrosia patterning on both surfaces. Curl figures that have an iridescent quality ---that seems almost 3 dimensional--- pop to your sight on both surfaces of this unique board. Along the Live Edges the bark has been left intact showcasing the natural history underneath the bark of the tree with unique color and grain details. This rustic, solid cherry wood serving / cutting board has nice figure with a beautiful curvy heartwood shape, an iridescent barcode figure grain and warm honey brown color. The live edge showcases the natural edge underneath the bark with dark tans and dark browns. Two feet run the width of the board to elevate it from the work surface. The elevated surface allows this board to double as a comfortable height cutting board and a unique serving tray; complimenting cheeses, grapes, olives...any appetizer or natural food with a rustic feel...perfect for dinner parties or gatherings as an natural art, focal serving piece. This rustic, solid wood serving / cutting board has been hand crafted from locally salvaged black cherry from Central Massachusetts. It has a natural, organic shaped curvy live edge; full of color with browns and tans;showcasing the natural history underneath the bark. It is lightly figured, with a beautiful grain and warm honey brown color. Splashes of brown colors appear almost painted on the surface. This cottage chic, rustic, solid wood serving / cutting board has been hand crafted from locally salvaged American Elm from Central Massachusetts. A simple, natural grain, with an overall silvery white coloring. Two Black Walnut feet run the width of the board, juxtaposing the silvery white of the elm with the deep brown of the black walnut and elevating it nicely from your word surface. 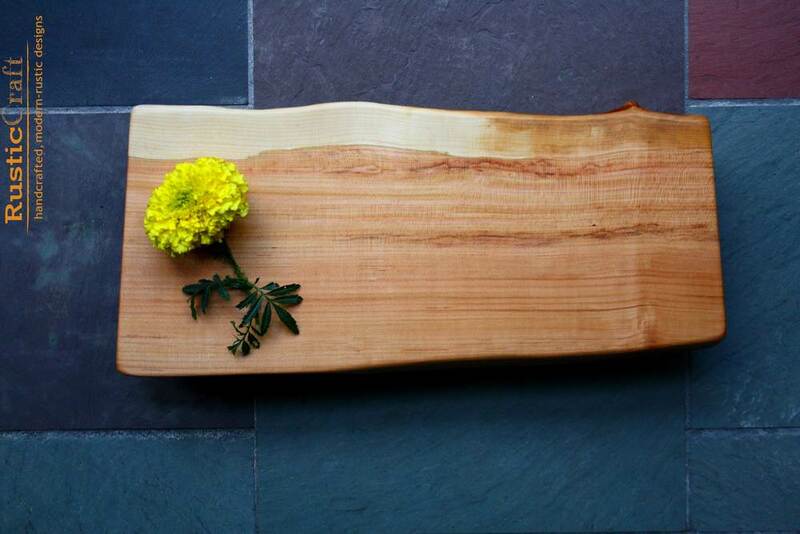 This American Elm board is perfect for use as a unique party serving tray---cheese serving tray, sushi serving tray---in addition to being a functional cutting board; with additional personalization it is perfect for a wedding gift, anniversary gift, or engagement gift. An amazing natural grain, with an overall reddish tan yellow coloring; this small-long cutting board has a live edge runs it's length, showcasing the natural coloring underneath the bark. Two Black Walnut feet run the width of the board, elevating it nicely from your word surface while giving beautiful juxtaposition between the neutral colored White Ash and the Ch9ocolate Brown Walnut. The grain pattern is very pronounced, with variable-length grains interrupted by dark brown tangential bands that visibly wrap around the side edges in a very unique pattern. Hand Crafted from locally salvaged White Ash & Black Walnut from central Massachusetts, this footed board is perfect for use as a small, solid cutting board or unique rustic party serving tray; with additional personalization it is perfect for a wedding gift, anniversary gift, or a birthday gift. This rustic, solid wood serving / cutting board has been hand crafted from locally salvaged black cherry from Central Massachusetts. This board has a beautiful grain and an overall warm honey brown color with a gradations of yellows tans towards the sapwood adjacent to the live edge. A few instances of grain stripes appear to be almost 'hand-painted'..with a wavy look longitudinally through the board. Two black cherry feet run the width of the board to elevate it nicely from the work surface while a curvy live edge running the length of the board gives unique depth of color and character, showcasing the natural colors underneath the bark. This footed black cherry would make an amazing rustic serving platter; complimenting cheeses, grapes, olives...any appetizer or natural food with a rustic feel! This thick, cottage chic, rustic, solid wood serving / cutting board has been hand crafted from locally salvaged American Elm from central Massachusetts. This Elm has a clear natural grain with a silvery yellow natural coloring with some amazing instances of black line grain adjacent to the live edge---with black tunnel holes and streaks resembling antique barnboard! An iridescent barcode figure in the grin ads visual interest to the surface. A sculpted groove along the heartwood length gives a unique tactility to this edge. This Thick cutting block is perfect for use as a solid cutting board or unique party serving tray; with additional personalization it is perfect for a wedding gift, anniversary gift, or a birthday gift. It measures approx. 14.8in. long x 7.5in. wide. This is a THICK and HEAVY board. A very solid, rustic, American elm wood serving / cutting board with an overall clear and beautiful grain and warm honey yellow tan color. A full of color live edge runs the length of the board, showcasing the board history just underneath the bark, with some amazing instances of black line grain adjacent to the live edge---with black tunnel holes and streaks resembling antique barnboard! An iridescent barcode figure in the grain adds visual interest to the surface. Both sides of this incredible board are able to be utilized---we recommend using one side for cutting, and flipping it over for dinner parties or gatherings for use as an natural art, focal serving piece; complimenting cheeses, grapes, olives...any appetizer or natural food with a rustic feel! This medium sized, rustic, solid wood serving / cutting board has been hand crafted from locally salvaged Black Cherry from Central Massachusetts. It has gorgeous figure from the sapwood of the cherry tree to the heartwood with a beautiful grain and warm honey brown color. The live edge is full of dark brown and tan colors; showcasing the natural history underneath the bark of the cherry tree. Two Black Cherry feet run the width of the board to elevate it from the work surface nicely. This footed black cherry would make an amazing little cutting board, rustic cheese serving platter, sushi serving tray or great for any appetizer or natural food with a rustic feel! Perfect for a small dinner get together. Gives a modern kitchen an essence of rustic charm. This small footed black cherry has been handcrafted from salvaged lumber from Central Massachusetts. With an amazing organic curvy shape, the majority of the board surface is a warm, honey brown color; gradating to light tans at the live edge of the board...with a dark tan grain character figure splashing across the board surface from the left. A natural live edge runs across the length of the board, showcasing the natural history underneath the bark. A small surface check appears adjacent to the wave-like color line between the heartwood and sapwood demarcation. An instance of birdseye figure occurs along the lower right top surface, giving this area a 3d iridescent quality. This medium rustic, solid wood serving / cutting board has been hand crafted from locally salvaged black cherry from Central Massachusetts. It is lightly figured, with a beautiful grain and warm honey brown color. It has a rectangular shape with a natural arc and a flare towards the left. Gives a modern kitchen an essence of rustic charm. This beautiful & rustic, solid wood serving / cutting board has been hand crafted from locally salvaged black cherry from Central Massachusetts. It has a beautiful wood figure, with an amazing quilted figure everywhere on the top surface --- giving the entire top surface of the board this incredible 3d iridescent quality. Juxtaposition of grain colors from sapwood to heartwood add a unique beauty to the honey brown cherry wood color, with a clear grain that waves out towards the heartwood. A live edge runs the length of the board with tunnel details that showcase the history underneath the bark of the cherry tree. Two feet run the length of the board elevating it nicely from your work surface; making this footed board a joy to use and doubling it's function as a gorgeous cheese or appetizer serving platter, giving a modern kitchen an essence of rustic charm. This Medium cottage chic, rustic, solid wood serving / cutting board has been hand crafted from locally salvaged American Elm from central Massachusetts. This elm has this has nice, clear straight grain, with a live edge that runs the length of the board, and black streaks and tunnel holes adjacent to the live edge, giving a barnboard looking quality to the surface. Two American elm feet run the width of the board, elevating it nicely from the work surface. This footed board is perfect for use as a solid cutting board or unique party cheese serving tray; with additional personalization it is perfect for a wedding gift, anniversary gift, or a birthday gift. This Agrarian Style, beautiful & rustic, solid wood serving / cutting board has been hand crafted from thick, locally salvaged Northern Red Oak from Central Massachusetts. It has a beautiful rustic figure, with straight grain patterns interrupted with amazing splashes of subtle quilt figure ---giving these areas an iridescent quality. Coloring is a majority of warm honey brown color with a variegated live edge that runs along the rear long edge. Details underneath the bark have been preserved along this live edge, giving an amazing character to this unique cutting board. A sculpted edge occurs on the top edge. Two Black Walnut feet run the length of this Red Oak board elevating it nicely from your work surface; making this footed board a joy to use and doubling it's function as a gorgeous cheese or appetizer serving platter, giving a modern kitchen an essence of rustic charm. This medium footed black cherry has been handcrafted from salvaged lumber from Central Massachusetts. With an amazing organic curvy shape, the majority of the board surface is a warm, honey brown color; gradating to light tans at the live edge of the board...with a dark tan grain character figure splashing across the board surface from the left. A natural live edge runs across the length of the board, showcasing the natural history underneath the bark. An instance of quilt figure occurs along the top right surface, giving this area a 3d iridescent quality. Two matching black cherry feet fun the width of this gorgeous board, elevating it from your work surface for ease of use. This medium sized, rustic, solid wood serving / cutting board has been hand crafted from locally salvaged Black Cherry from Central Massachusetts. It has gorgeous figure from the sapwood of the cherry tree to the heartwood with a beautiful grain and warm honey brown color. The live edge is full of tunnel details; showcasing the natural history underneath the bark of the cherry tree. This Elm has a clear natural grain with a silvery yellow natural coloring. A sculpted edge running the length of the board parallels straight long edge. Two Black Walnut feet run the width of the board, elevating it nicely from the work surface while providing an amazing contrast in natural color blocking. 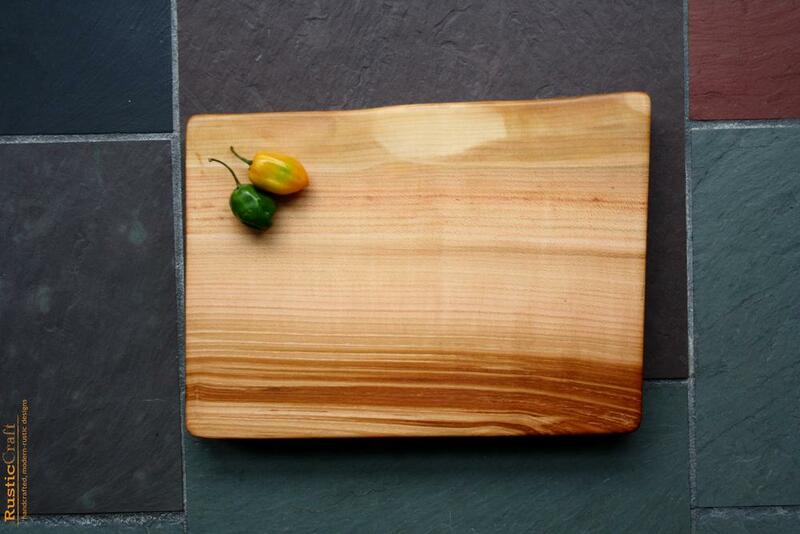 This footed board is perfect for use as a solid cutting board or unique party serving tray; with additional personalization it is perfect for a wedding gift, anniversary gift, or a holiday gift. This Elm has a clear natural grain with a silvery yellow natural coloring with some amazing instances of black line grain adjacent to the live edge---with black tunnel holes and streaks resembling antique barnboard!. Two Elm feet run the width of the board, elevating it nicely from the work surface and providing a nice structural stability to the board. 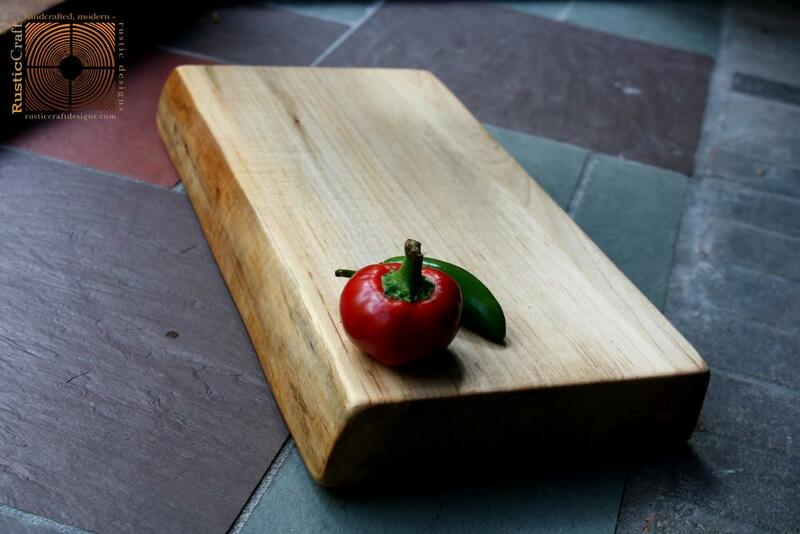 This footed board is perfect for use as a solid cutting board or unique party serving tray; with additional personalization it is perfect for a wedding gift, anniversary gift, or a birthday gift. Handcrafted from salvaged Ambrosia Maple from Central Massachusetts, here is a clear light maple board with a honey silver coloring throughout interrupted by a single band of blacks, tans and spots of brown ambrosia detailing. Simply an amazing work of nature. The live edges give the board a unique, organic character; giving depth of color and character to this beautiful piece. Two ambrosia maple feet run the width of the board, elevating it nicely from your work surface. The feet are gorgeous in and of themselves---cut the showcase a couple ambrosia splash details on one and the other showcasing a slight spalted character with varying colors along the side of the foot. This gorgeous, solid wood serving / cutting board has been hand crafted from locally salvaged spalted black walnut from Central Massachusetts. This board has a large spalt detail occurring all along the top surface, giving the grain an amazing depth of color and character. This board features a unique, organic shape with a honed barked live edge on the long edge, and a sculpted edge on the parallel edge. Two Old Growth Douglas Fir feet run the width of the board, juxtaposing the wood species with an amazing pop of grain and coloring. These feet were actually salvaged from an amazing piece of HEAVY old growth fir lumber from the Columbia Hotel at 65 main St., Leominster Massachusetts. A 6 alarm fire destroyed this historic building, built in 1892, on November 24th, 2012. These boards are amazing, with a rich brown orange color, and wide growth rings. This solid black walnut footed board is perfect for use as a unique sushi serving board, rustic serving tray or cheese board; perfect for a one of a kind wedding or anniversary gift. This gorgeous, solid wood serving / cutting board has been hand crafted from locally salvaged black walnut from Central Massachusetts. This incredibly beautiful black walnut board is VERY black---cut from the heartwood of the tree---the delineations between heartwood and sapwood are slight with a majority of the board a very deep brown/black color. An organically shaped live edge runs the length of the board, showcasing the natural history of the tree underneath the bark. One side of the live edge features slight spalt character---giving variations of color in the grain to this area. The opposite surface features two knot details. Included with the board are two American Elm wood rails, with anti-skid rubber grips on both sides. This design feature allows the rails to be placed upon the counter top and the board to be placed atop the rails. Since the board is not attached to the rails this allows for both sides of this incredible board to be utilized---we recommend using one side for cutting, and flipping it over for dinner parties or gatherings for use as an natural art, focal serving piece. It measures approx. 18.5in. length x 12in. width at the longest point and 9in. width overall. This Medium, thick maple board features many bands of dark coloring in the grain; appearing almost randomly with an area of distinguishable ambrosia detailing occurring on one surface and continuing through to the other side. The surface is incredibly smooth and a live edge features full of color detailing--with many gulleys of dark coloring---showcasing the natural beauty of the tree just underneath the bark. The darkness in figure of this rectangular shaped maple is quite unique. Hand crafted from locally salvaged maple from Central Massachusetts; both sides of this incredible board to be utilized---we recommend using one side for cutting, and flipping it over for dinner parties or gatherings for use as an natural art, focal serving piece. This unique block would make an amazing gift for a natural foodie; adding a rustic charm to any modern kitchen. This is a lightly quilted ambrosia maple board with a light silver coloring throughout interrupted by varying bands of blacks, tans and spots of browns. The quilt figure is the iridescent bands you see running perpendicular to the length of the board---these figures give the board a rippled look, but the board surface is actually flat and smooth to the touch! Simply an amazing work of nature. The board has a organic shaped live edge giving depth of color and character to this beautiful piece. Both sides of this incredible board are able to be utilized---we recommend using one side for cutting, and flipping it over for dinner parties or gatherings for use as an natural art, focal serving piece. This unique block would make an amazing gift for your natural foodie; adding a rustic charm to any modern kitchen. This incredibly beautiful black walnut board is VERY black---cut from the heartwood of the tree---the delineations between heartwood and sapwood are very slight with a majority of the board a very deep brown/black color. An organically shaped live edge runs the length of the board, showcasing the natural history of the tree underneath the bark. Spalt character appears on the top left surface. This incredibly beautiful black walnut board is VERY black---cut from the heartwood of the tree---the delineations between heartwood and sapwood are very slight with a majority of the board a very deep brown/black color. A live edge runs the length of the board, showcasing the natural history of the tree underneath the bark. A Curl ridge detail occurs on the surface giving a 3d effect to the board. This gorgeous, solid wood serving / cutting board has been hand crafted from locally salvaged spalted black walnut from Central Massachusetts. This board has a large spalt detail occurring along the live edge on both surfaces, giving the grain an amazing depth of color and character. This board features a finished squared edge on the ends with a honed barked live edge on the long edge. Hand crafted from locally salvaged black cherry from Central Massachusetts, this small, rustic, solid wood serving / cutting block has a beautiful organic shape with a live edge along the sapwood and a straight edge at the heartwood. This board has a beautiful large curvy grain where grain curves and wraps around former branch formations in the center of which birdseye details occur. It measures approx. 16in. in length x 6.5in. in width. This organically shaped and beautiful figured Maple board features tiger curling across the top surface and wrapping down the sculpted edge; these holographic 'ridges' give a 3d quality to the surface---making it appear rippled but it is actually smooth and silky! The top edge is a live, full or color edge--with many gulleys of dark coloring. Two Maple feet run the width of the board, elevating the board from your work surface nicely. Hand crafted from locally salvaged maple from Central Massachusetts.This unique block would make an amazing gift for a natural foodie; adding a rustic charm to any modern kitchen. This Large and thick maple board features two live edges feature full of color detailing--with many gulleys of dark coloring---showcasing the natural beauty of the tree just underneath the bark. This hard maple features dark color splashes from ambrosia figures---and many instances of quilt figure and birdseye figure---giving a 3d iridescent quality to the surface of the board. The darkness in figure of this organically shaped maple is quite unique. 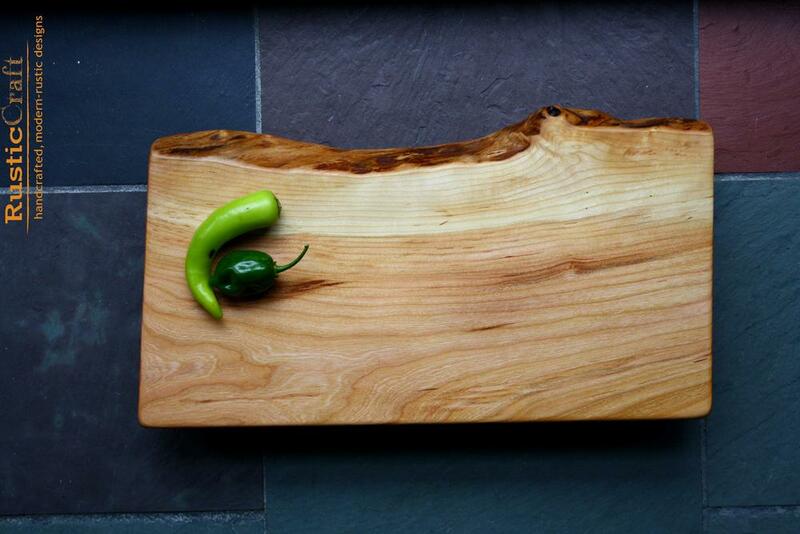 Hand crafted from locally salvaged maple from Central Massachusetts; both sides of this board can be utilized. We recommend using one side for cutting, and flipping it over for dinner parties or gatherings for use as an natural art, focal serving piece. This unique block would make an amazing gift for a natural foodie; adding a rustic charm to any modern kitchen. This rustic, solid wood serving / cutting board has been hand crafted from locally salvaged black cherry from Central Massachusetts. This board has a beautiful grain and an overall warm honey brown color with gradations of yellows tans and browns. A few instances of grain stripes appear to be almost 'hand-painted'..with a wavy look longitudinally through the board. This is a lightly quilted ambrosia maple board with a light silver coloring throughout interrupted by varying bands of blacks, tans and spots of browns. The quilt figure is the iridescent bands you see running perpendicular to the length of the board---these figures give the board a rippled look, but the board surface is actually flat and smooth to the touch! Simply an amazing work of nature. The board has a organic shaped live edge giving depth of color and character to this beautiful piece. This rustic, solid wood serving / cutting board has been hand crafted from locally salvaged black cherry from Central Massachusetts. It has a natural, organic shaped live edge; full of color and tunneling details showcasing the natural history underneath the bark. It is lightly figured, with a beautiful grain and warm honey brown color. Two maple feet run the width of the board, juxtaposing colors gorgeously. It measures approx. 17.5in. in length x 7.5in. in width. Thickness is approx. : 1in. thick. Overall height approx. 2.4in. high. This rustic, solid cherry wood serving / cutting board has nice figure with a beautiful curvy heartwood grain and warm honey brown color. The live edge showcases the natural edge underneath the bark. This gorgeous, solid wood serving / cutting board has been hand crafted from locally salvaged black walnut from Central Massachusetts. This board has a large spalt detail occurring along the live edge on both surfaces, giving the grain an amazing depth of color and character. A semi circle knot detail occurs on one short edge. This board features a finished squared edge on the ends with a honed barked live edge on the long edge. This solid black walnut footed board is perfect for use as a unique sushi serving board, rustic serving tray or cheese board; perfect for a wedding or anniversary gift. This gorgeous, solid wood serving / cutting board has been hand crafted from locally salvaged black walnut from Central Massachusetts. This incredibly beautiful black walnut board is VERY black---cut from the heartwood of the tree---the delineations between heartwood and sapwood are slight with a majority of the board a very deep brown/black color. Two live edges run the length of the board, showcasing the natural history of the tree underneath the bark. A knot detail occurs along the live edge with a little brown swoop. One of the live edges features slight spalt character---giving variations of color in the grain to this area. Included with the board are two Black Walnut wood rails, with anti-skid rubber grips on both sides. This design feature allows the rails to be placed upon the counter top and the board to be placed atop the rails. Since the board is not attached to the rails this allows for both sides of this incredible board to be utilized---we recommend using one side for cutting, and flipping it over for dinner parties or gatherings for use as an natural art, focal serving piece. This incredibly beautiful black walnut board is VERY black---cut from the heartwood of the tree---the delineations between heartwood and sapwood are slight with a majority of the board a very deep brown/black color. Two live edges run the length of the board, showcasing the natural history of the tree underneath the bark. Curl details occur throughout the surfaces giving a 3d effect to the board. A couple knot details occur with a perfect semicircle on the edge and a little brown swoop occurring on the bottom center surface. One of the live edges features slight spalt character---giving variations of color in the grain to this area. This beautiful Black Walnut board has been hand crafted from locally salvaged black walnut from Central Massachusetts. Handcrafted from salvaged Ambrosia Maple from Central Massachusetts, here is a thick maple board with a honey silver coloring throughout interrupted by varying bands of blacks, tans and spots of brown ambrosia detailing. Simply an amazing work of nature. A live edge gives the board a unique, organic character; giving depth of color and character to this beautiful piece. This Elm has a clear natural grain with a silvery yellow natural coloring with some instances of black line grain. Two Spalted Black Walnut feet run the width of the board, elevating it nicely from the work surface and juxtaposing the light clear color with a dark . This footed board is perfect for use as a small solid cutting board or unique party serving tray; with additional personalization it is perfect for a wedding gift, anniversary gift, or a birthday gift. It measures approx. 12.8? long x 6.2" wide. Thickness is approx. : 1.1? thick. Overall height with feet approx. 2.6" high. This Small, cottage chic, rustic, solid wood serving / cutting board has been hand crafted from locally salvaged American Elm from central Massachusetts. This elm has this has nice, clear straight grain, with a slight iridescent quality to the surface. Two American elm feet run the width of the board, elevating it nicely from the work surface. This footed board is perfect for use as a solid cutting board or unique party cheese serving tray; with additional personalization it is perfect for a wedding gift, anniversary gift, or a holiday gift. Here is a lightly quilted ambrosia maple board with a light silver coloring throughout interrupted by varying bands of blacks, tans and spots of browns. The quilt figure is the iridescent bands you see running perpendicular to the length of the board---these figures give the board a rippled look, but the board surface is actually flat and smooth to the touch! Simply an amazing work of nature. The board has a organic shaped live edge giving depth of color and character to this beautiful piece. This Elm has a clear natural grain with a silvery yellow natural coloring. A sculpted edge running the length of the board parallels a full of color live edge, showcasing the natural history underneath the bark. The grain along the top surface adjacent to the live edge features many streaks of black mineral coloring, giving a rustic barnboard feel to this unique wood species. Two Elm feet run the width of the board, elevating it nicely from the work surface. Hand crafted from locally salvaged black cherry from Central Massachusetts, this large, rustic, solid wood serving / cutting block has a beautiful organic shape with a live edge along the sapwood and a sculpted edge at the heartwood. This board has a beautiful large curvy grain where grain curves and wraps around former branch formations in the center of which birdseye details occur. This Farmhouse Style, Extra Large, over two feet long, beautiful & rustic, solid wood serving / cutting board has been hand crafted from locally salvaged black cherry from Central Massachusetts. It has a beautiful rustic figure, with an amazing wavy grain that radiates out from a sculpted side edge heartwood. An amazingly wild live edge with a sawn knot detail make this board incredibly unique and one of a kind. Coloring is a majority of warm honey brown color with a variegated live edge that runs along both long edges. Details underneath the bark have been preserved along this live edge, giving an amazing character to this unique cutting board. Two Black Walnut feet run the length of this black cherry board elevating it nicely from your work surface and juxtaposing the colorings of the wood grains; making this footed board a joy to use and doubling it's function as a gorgeous cheese or appetizer serving platter, giving a modern kitchen an essence of rustic charm. This small rustic, solid wood serving / cutting board has been hand crafted from locally salvaged black cherry from Central Massachusetts. It is lightly figured, with a beautiful grain and warm honey brown color. Gives a modern kitchen an essence of rustic charm. This rustic, solid cherry wood serving / cutting board has nice figure with a beautiful curvy heartwood grain and warm honey brown color. The live edges showcase the natural edge underneath the bark, with the live edges on both long edges this board is quite unique. This solid cherry wood serving and cutting board has a beautiful grain and warm honey brown color. A Natural live edge along the sapwood showcases the area underneath the tree bark---with tunneling details all along the edge. The variation in heartwood and sapwood natural coloring make this board quite unique. Two matching black cherry feet run the length of this honey-brown board elevating the board from the work surface nicely. This rustic, solid wood serving / cutting board has been hand crafted from locally salvaged black cherry from Central Massachusetts. It has a natural, organic shaped live edge; full of color showcasing the natural history underneath the bark. It is lightly figured, with a beautiful grain and warm honey brown color. Two black cherry feet run the width of the board. The elevated surface allows this board to double as a comfortable height cutting board and a unique serving tray; complimenting cheeses, grapes, olives...any appetizer or natural food with a rustic feel! This Large and thick maple board features two live edges feature full of color detailing--with many gulleys of dark coloring---showcasing the natural beauty of the tree just underneath the bark. This hard maple features dark color splashes from many ambrosia figures---and many instances of quilt figure---giving a 3d iridescent quality to the surface of the board. The darkness in figure of this organically shaped maple is quite unique. Hand crafted from locally salvaged maple from Central Massachusetts; This board comes with spalted walnut stands with anti-skid grips---allowing both sides of this incredible board to be utilized while sitting above teh countertop on the stands.--we recommend using one side for cutting, and flipping it over for dinner parties or gatherings for use as an natural art, focal serving piece. This unique block would make an amazing gift for a natural foodie; adding a rustic charm to any modern kitchen. This Large and thick maple board features many bands of dark coloring in the grain; appearing almost randomly with a large area of distinguishable ambrosia detailing occurring on one surface and wrapping down the edge. Two live edges feature full of color detailing--with many gulleys of dark coloring---showcasing the natural beauty of the tree just underneath the bark. The darkness in figure of this organically shaped maple is quite unique. This is an Ambrosia Tiger Maple---with an incredible amount of tiger curl figure combined with an equally incredible amount of ambrosia detail---AHmazing. The tiger curl gives the surface an iridescent wavy look--looking like ripples n the surface, but the board is smooth as silk to the touch. Ambrosia splashes occur repeatedly throughout the surface--the tan and brown swooshes caused by mineral deposits during the trees formation---the curling detail makes the ambrosia details stand out so intensely! This Large thick and beautiful dark maple board features two live edges feature full of color detailing--with many gulleys of dark coloring---showcasing the natural beauty of the tree just underneath the bark. Quilt figures radiate from a center branch ring detail--giving an iridescent quality to the surface. Many bands of dark coloring in the grain appear almost randomly with some instances of distinguishable ambrosia detailing occurring on one surface and wrapping down the edge. The darkness in figure of this organically shaped maple is quite unique. This large rustic, solid wood serving / cutting board has been hand crafted from locally salvaged black cherry from Central Massachusetts. With live edges full of tunneling detailing, showcasing the natural history underneath the bark of the cherry tree, this board has gorgeous figure from the sapwood of the cherry tree to the heartwood with a beautiful grain and warm honey brown color mixed in between amazing light yellow colors of two live edges. Two black cherry feet run the width of the board, elevating it nicely from your work surface. This footed black cherry would make an amazing little small cutting board, rustic cheese serving platter, sushi serving tray or great for any appetizer or natural food with a rustic feel! Perfect for a small dinner get together. This large rustic, solid wood serving / cutting board has gorgeous figure from the sapwood of the cherry tree to the heartwood with a beautiful grain and warm honey brown color mixed in between amazing light yellow colors of two live edges. It has been hand crafted from locally salvaged black cherry from Central Massachusetts.The live edges are full of tunneling detailing, showcasing the natural history underneath the bark of the cherry tree. This medium-large rustic, solid wood serving / cutting board has been hand crafted from locally salvaged black cherry from Central Massachusetts. With live edges full of tunneling detailing, showcasing the natural history underneath the bark of the cherry tree, this board has gorgeous figure from the sapwood of the cherry tree to the heartwood with a beautiful grain and warm honey brown color mixed in between amazing light yellow colors of two live edges. This medium-large rustic, solid wood serving / cutting board has gorgeous figure from the sapwood of the cherry tree to the heartwood with a beautiful grain and warm honey brown color mixed in between amazing light yellow colors of two live edges. It has been hand crafted from locally salvaged black cherry from Central Massachusetts.The live edges are full of tunneling detailing, showcasing the natural history underneath the bark of the cherry tree. This rustic, solid wood serving / cutting board has been hand crafted from locally salvaged black cherry from Central Massachusetts. This board has a beautiful grain and an overall warm honey brown color with gradations of yellows tans and browns. A few instances of grain appear to be almost ‘hand-painted’..with a wavy look longitudinally through the board. Two black cherry feet run the width of the board to elevate it nicely from the work surface while a live edge running the length of the board gives unique depth of color and character, showcasing the natural colors underneath the bark. This large black cherry has been handcrafted from salvaged lumber from Central Massachusetts.The majority of the board surface is a warm, honey brown color; gradating to light tans and dark tan grain character figures across the board surface. A natural live edge runs across the length of the board. An instance of birdseye figure occur on the top surface, giving this area the look of swirling eyes. Handcrafted from salvaged Silver Maple from Central Massachusetts, here is a quilted maple board with a honey silver coloring throughout interrupted by varying bands of blacks, tans and spots of browns. The quilt figure is the iridescent bands you see running perpendicular to the length of the board—these figures give the board a rippled look, but the board surface is actually flat and smooth to the touch! Simply an amazing work of nature. A slight arc gives the board a unique, organic shape and long live edges give depth of color and character to this beautiful piece. Included with the board are two maple wood rails, with anti-skid rubber grips on both sides. This design feature allows the rails to be placed upon the counter top and the board to be placed atop the rails. Since the board is not attached this allows for both sides of this incredible board to be utilized—we recommend using one side for cutting, and flipping it over for dinner parties or gatherings for use as an natural art, focal serving piece. Here is a uniquely figured maple board with a honey silver coloring throughout interrupted by varying bands of blacks, tans and spots of browns. A few ambrosia splashes occur along with spots and bands of quilt figure. The quilt figure is the iridescent bands you see running perpendicular to the length of the board---these figures give the board a rippled look, but the board surface is actually flat and smooth to the touch! Simply an amazing work of nature. A slight arc gives the board a unique, organic shape and long live edges give depth of color and character to this beautiful piece. Included with the board are two maple wood rails, with anti-skid rubber grips on both sides. This design feature allows the rails to be placed upon the counter top and the board to be placed atop the rails. Since the board is not attached this allows for both sides of this incredible board to be utilized---we recommend using one side for cutting, and flipping it over for dinner parties or gatherings for use as an natural art, focal serving piece. Here is a quilted maple board with a honey silver coloring throughout interrupted by varying bands of blacks, tans and spots of browns. The quilt figure is the iridescent bands you see running perpendicular to the length of the board—these figures give the board a rippled look, but the board surface is actually flat and smooth to the touch! Simply an amazing work of nature. A slight arc gives the board a unique, organic shape and long live edges give depth of color and character to this beautiful piece.